Massive thanks to all who took part and stood in solidarity against racism this October. Show Racism the Red Card would like to take this opportunity to offer our heartfelt thanks to everyone throughout the UK who supported Wear Red Day 2016. Your support can make a difference and we will continue working as hard as we can to counter some of the narratives that have threatened to divide our communities recently. In October, the 2nd ever Wear Red Day (WRD) took place and was a wonderful success, building on the pilot initiative of October 2015. 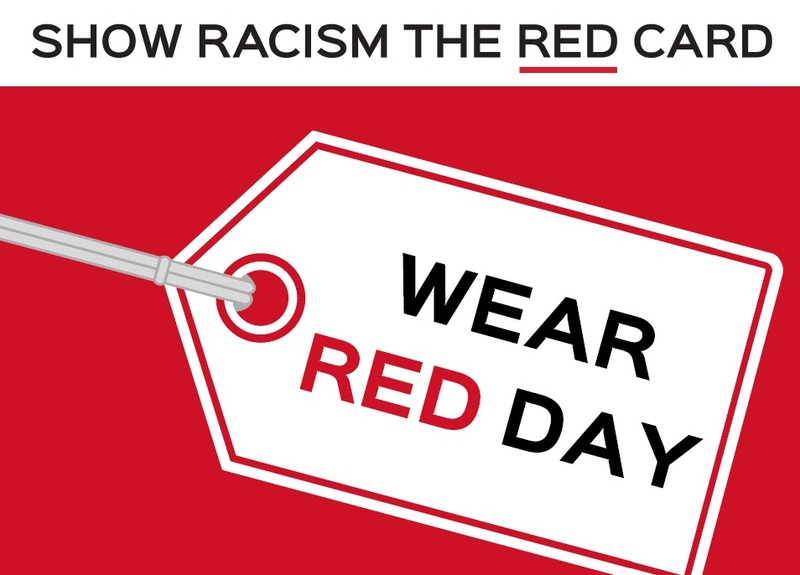 The simple premise of donating £1 and wearing red in support of Show Racism the Red Card (SRtRC) caught the hearts and imaginations with people right across England, Scotland and Wales making a stand against racism. #WRD16 was a triumph, helping raise awareness of issues of racism, raise awareness of the very important work undertaken by SRtRC and raise much needed funds for the charity to continue to educate against the scourge of racism. Wear Red Day 2016 encouraged individuals, schools and organisations to get involved all over the UK with fantastic backing from trade unions, including members of USDAW, NUT, Unite the Union, PFA, GMB, Nautilus, Equity, Musicians’ Union, Prospect, BECTU, NUJ, TUC and PCS. Wear Red Day gained support from England Manager and SRtRC Hall of Fame member, Gareth Southgate and the England Women’s Team alongside a host of current and former professional footballers throughout the UK, including Thierry Henry, Rachel Yankey OBE, Yoan Gouffran, Callum Chambers, Izzy Christiensen & Lucy Bronze, being joined by SRtRC patrons John Barnes, Chris Kamara, Bryan Robson & Chris Hughton. #WRD16 also received support from football clubs, with Manchester United FC, Manchester City Women FC, Middlesbrough FC, West Bromwich Albion FC, Middlesbrough Ladies FC, Newcastle United, Sunderland AFC, Everton FC, Doncaster Belles FC, Plymouth Argyle FC, Plymouth Argyle Ladies FC, Brighton & Hove Albion FC, Huddersfield Town FC, Reading FC & Derby County FC all standing proud against racism. "With a rise in hate crime post referendum, the work of Show Racism the Red Card is so incredibly important. GMB never has and never will let racism go unchallenged, that's why we're proud to wear red today to support the organisation and the message." In an incredibly positive statement against racism, Stockton-on-Tees Borough Council, turned the lights red around some of the borough’s most prominent landmarks in support of #WRD16. And in Gateshead and Newcastle, the famous Millennium Bridge was turned red to mark the support of Gateshead Council.